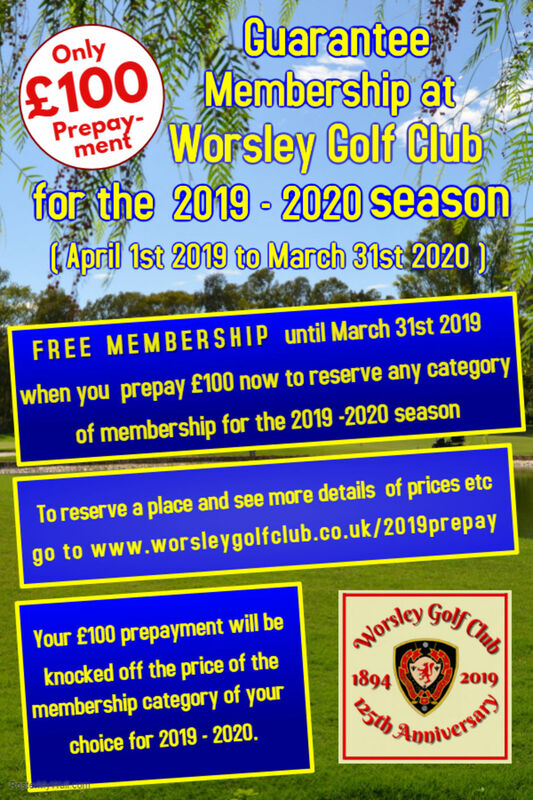 This Prepayment Deal is available for all who wish to join Worsley Golf Club as new members in any category of membership as from Feb 1st 2019. The range of membership categories can be seen on this link. The prices shown here are for the 2018-19 season and these may well change for the 2019-20 season, depending on decisions made at the AGM in March 2019. Full membership will be granted immediately to all new members who sign up to the Prepayment Deal, in the membership category of their choice. When the 2019-20 subscription notices are issued at the end of March, those who have made the £100 Prepayment will receive an invoice based on the category prices agreed at the AGM, less of course their £100 Prepayment. Please complete the form below if you would like to join us. Best wishes from the Membership Team. It will help greatly with our Marketing if you would please say in a few words why you want to join Worsley GC ? Data Protection: Are you agreeable to us using the information which you supply to us for the purposes of contacting you as regards your membership of WGC and for competitions purposes where necessary? Please selectYes please use this data to contact me until such time as my membership of WGC come to an end.I do not wish to have any further contact from WGC.